What type will your child have? What can you expect after your child has anesthesia? Anesthesia controls pain during surgery or another kind of procedure. Anesthesia will help relax your child and block pain. It could also make your child sleepy or forgetful. Or it may make him or her unconscious. It depends on what kind your child gets. Your child's anesthesia provider (anesthesiologist) will make sure your child is comfortable and safe during the procedure or surgery. There are different types of anesthesia. Local anesthesia. This type numbs a small part of the body. Doctors use it for simple procedures. Your child will get a shot in the area the doctor will work on. Your child may stay awake during the procedure. Or your child may get medicine to help him or her relax or sleep. Peripheral nerve block. This is a shot near a specific nerve or group of nerves. It blocks pain in the part of the body supplied by the nerve. A nerve block is most often used for procedures on the hands, arms, feet, legs, or face. Epidural and spinal anesthesia. This is a shot near the spinal cord and the nerves around it. It blocks pain from an entire area of the body. This may be the belly, hips, or legs. General anesthesia. This type affects the brain and the whole body. Your child may get it through a small tube placed in a vein (IV). Or he or she may breathe it in. Your child will be unconscious and won't feel pain. During the surgery, your child will be comfortable. Later, he or she will not remember much about the surgery. The type of surgery or procedure and why your child needs it. Test results, such as blood tests. How worried your child feels about the surgery. Your child's health. The doctor and nurses will ask you about any past surgeries your child has had. They will ask about any health problems your child may have, such as diabetes or lung or heart problems. Your doctor may also ask if any family members have had problems with anesthesia. You will talk with the anesthesia provider about the options. You may be able to choose the type of anesthesia your child gets. Major side effects are not common. But all types of anesthesia have some risk. The risk depends on your child's overall health. It also depends on the type of anesthesia and how your child responds to it. Serious but rare risks include breathing problems and a reaction to the medicine. Some health conditions increase the risk of problems. Your child's anesthesia provider will find out about any health problems your child has that could affect his or her care. If your child has food in his or her stomach before surgery, food could be inhaled (aspirated) into the lungs. So it's important that your child have an empty stomach. The anesthesia provider will closely watch your child's vital signs during anesthesia and surgery. This includes checking blood pressure and heart rate. This may help your child avoid problems. Children do better if they know what to expect. You can make it less scary by being calm and talking about what will happen. Explain to your child that he or she will be in a strange place, but that many doctors and nurses will be there to help. Tell your child that there may be some discomfort or pain after the procedure. But remind him or her that you will be close by. Bring books or toys to comfort and distract your child. You will get a list of instructions to help prepare your child. Your doctor will let you know what to expect when you get to the hospital, during the surgery, and after. You will get instructions about when your child should stop eating and drinking. If your child takes medicine regularly, you will get instructions about what medicines your child can and can't take. You may be asked to sign a consent form that says you understand the risks of anesthesia. Before you do, your anesthesia provider will talk with you about the best type for your child and the risks and benefits of that type. Many children are nervous before they have anesthesia and surgery. Ask your doctor about ways to help your child relax. These may include relaxation exercises or medicine. Right after the surgery, your child will be in the recovery room. Nurses will make sure he or she is comfortable. As the anesthesia wears off, your child may feel some pain and discomfort. Tell someone if your child has pain. Pain medicine works better if your child takes it before the pain gets bad. When your child first wakes up from general anesthesia, he or she may be confused. Or it may be hard for your child to think clearly. This is normal. Your child may feel the effects of anesthesia for several hours. If your child had local or regional anesthesia, he or she may feel numb and have less feeling in part of his or her body. It may also take a few hours for your child to be able to move and control his or her muscles as usual. Nausea and vomiting. This does not usually last long. It can be treated with medicine. A slight drop in body temperature. Your child may feel cold and shiver when he or she wakes up. A sore throat, if your child had general anesthesia. After minor surgery, your child may go home the same day. After other types of surgery, your child may stay in the hospital. 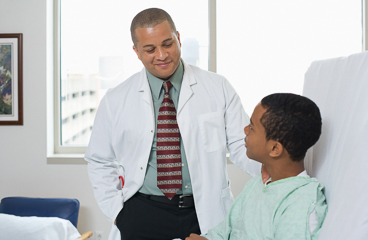 Your doctor will check on your child's recovery from the anesthesia and answer any questions. Enter Z177 in the search box to learn more about "Learning About Anesthesia for Your Child".